AUGUSTA, Ga. — The Masters tournament involves approximately 100 players taking a total of around 20,000 strokes. But in the end, it came down to just two: Louis Oosthuizen's astonishing albatross on No. 2, and Bubba Watson's ungodly pop-fly wedge shot from the woods on the second hole of a playoff. Both shots are now part of Masters lore, but only one man won a green jacket. The Masters that began with so many players finished up with just two, Oosthuizen and Watson, in a sudden-death playoff: Both players got good looks at a birdie on 18, with Watson barely missing a Masters-winning putt. Possibly rattled by that, Watson stuck his tee shot on No. 10 into the deep woods right of the green, but then uncorked a shot not even a video-game player could imagine: a straight-up wedge that landed within 15 feet for birdie. Needing two shots to win, Watson put his first putt close then tapped in his second for his first major win. Oosthuizen played a largely undistinguished round of golf, with one notable exception: a 3-under double eagle on the second hole that surely ranks as one of the greatest shots in Masters history. The 260-yard shot was enough to keep the field at bay for most of the round, and enough to give Oosthuizen a little room to waver through the course of the round. He steadied himself on the back nine, bringing home the same 10-under that he'd staked himself to on the second hole. Once again, Watson found himself in a playoff for a major championship. In 2010, he fell to Martin Kaymer in the PGA Championship. This year, there would be no such fade. The conventional wisdom was that Watson would either shoot in the low 60s or the high 70s, no middle ground. And indeed, he seemed on the verge of losing control right from the start, griping at the air en route to bogeying the very first hole. But he settled down, surrendering only one stroke the rest of the way and putting on a spectacular four-birdie run from Nos. 13 to 16. That was enough to put him 10-under and into a tie for the lead, a tie that would hold up into the playoff. Phil Mickelson, the favorite coming into the day, played 17 solid holes at a level good enough to stay in the hunt, if not own it. The problem was the fourth, where he pile-drove a shot into the side of a grandstand and then needed two right-handed shots (Mickelson is left-handed) to get it free of the dense jungle growth. He carded a triple-bogey 7, falling from 8-under to 5-under. And although he wouldn't bogey another hole, he left too many putts too short. He finished right where he started, at minus-8, staring up an impassable two-stroke incline at the leaders. Other highlights included two aces at No. 16, carded by Bo Van Pelt and Adam Scott, and Van Pelt's astonishing 8-under run to tie a Masters record. Lee Westwood didn't do his usual major fade, but his 4-under day to get to minus-8 simply wasn't enough. Matt Kuchar and 54-hole leader Peter Hanson both took turns at the lead, but couldn't hold. And Tiger Woods? A 2-over 74 to finish a dismal plus-5. 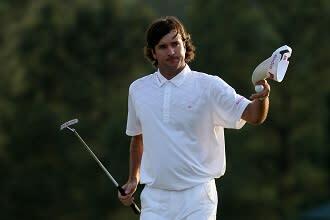 In the end, though, the final lingering image of this Masters was a tearful Bubba Watson, embracing his mother as the last of the light faded from the day. He'd finally broken into the ranks of golf's major winners with a well-deserved, hard-earned victory, and there was little more to do at that moment than weep in gratitude.